Cuando su barco llegue al puerto, aborde el Marlborough Flyer, un tren de vapor restaurado, y vea dos ciudades en un día. 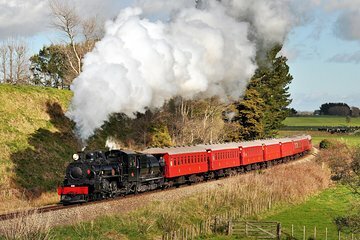 Siga a su guía en un viaje en tren panorámico entre Picton y Blenheim, donde tendrá tiempo libre para explorar las atracciones de Marlborough, o degustar el vino regional, cuando lo desee. Incluye servicio de transporte y ida y vuelta en tren. Tarifa de tren de ida y vuelta y traslado en crucero a la estación de tren. El tour es guiado y accesible en silla de ruedas. A great day out. We were late getting back to the cruise ship, but lucky the ship waited for us. Great staff onboard. A gorgeous steam train trip to Blenheim return. The Engine is just beautiful and we had 4 carriages out of 5 running on the day. The volunteers are very friendly and knowledgeable about the train and area ,offering wine and songs to Blenheim. Blenheim itself has very little to offer. Time is best spent at the Wine Station. My experience with Viator has always been exceptional tours. That is why I have scheduled tours with Viator. This time I scheduled shore excursion tours with Viator for my cruise. However, when my ship itinerary was changed due to a storm, I was in a panic and thought my vacation was going to be ruined! When I arrived on the ship, guest services allowed me to call customer service at Viator at 3:30am to change the dates of my shore excursions. Mike and Brian both at Viator customer service informed me that the cruise line and tour services were working to make the changes. My Viator shore excursions went perfectly. The train ride was fun! Exceptional wine/cheese plate at the wine station. Picton was a lovely town to stroll the square, gardens and art museum. Great trip. Enjoyed it tremendously!! Would highly recommend. Take a trip back in time on the beautifully restored Marlborough Flyer. Lovely old steam Smoke train running from Picton to Blenheim. We had over 2 hours to explore Blenheim or visit local wineries. A lovely journey in a lovely part of the world. Especially if you like trains don't miss this one. Every detail we were given about this trip was spot on. No dramas which is good for first time overseas travellers. Shuttle to Picton from wharf, dropped off opposite the train station, train trip was excellent. Time in Blenheim to wander around and take in the sights. Back to Picton which is such a pretty place. Markets were wonderful. Once again the commentary on the train was excellent, seems like everyone in NZ has a great sense of humour. Great. The train ride was very relaxing and enjoyable. Standing outside give you the opportunity to take great pictures. Marlborough is a nice little town to have your lunch and walk around. We had a memorable and enjoyable journey on the Marlborough Flyer to Blenheim, the scenery was beautiful even though the weather was not good.